On June 17, a mixture of 72 professional and amateur participants came out and tested their endurance and dedication against near 100-degree weather. 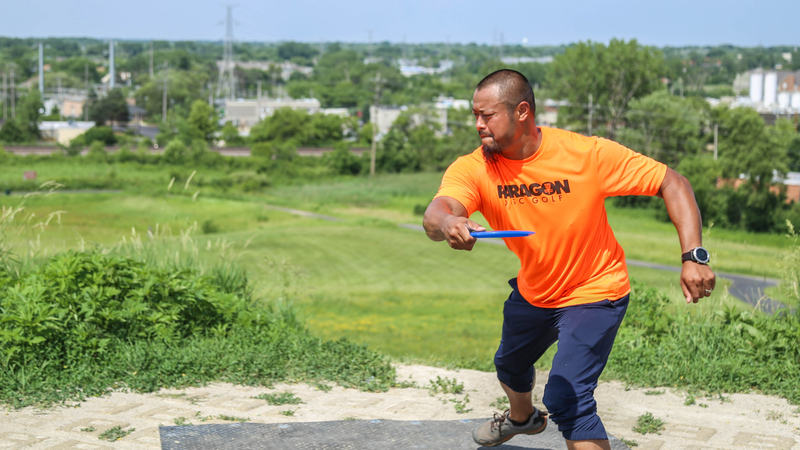 2018 marked the fourth year of the Palatine Classic and the third year sanctioned by the Professional Disc Golf Association (PDGA). The tournament saw winners in seven separate divisions battle the elements and earn their place atop the leaderboard. Players at the event competed for a professional purse of over $1,000, merchandise, and PDGA rankings. The Palatine Classic was also a Grow Disc Golf $5K/$10K Challenge Event where participants had a chance to win prize money by acing the 1st hole during the first round. In the Open Division several players put up the highest scores of the tournament, including low score for the day 99 (21-under par) by Edward Ward. Also in the Open Division and putting up impressive scores included Dan Schlitter 101 (19-under par), Steven Jacobs 102 (18-under par), and Nathan Day 104 (16-under par). Ward really thrived as the day grew longer scoring an impressive 42 for the second round (18-holes). The Pro Masters 40+ Division also included some spectacular play throughout the day. Allen Hermosilo completed the day with a 105 (15-under par) to earn the first-place position while Aaron Alinowski came in second with a 107 (13-under par), Alinowski aced hole #4 during his first round. Michael Walsh brought home the Amateur Masters 50+ division with a score of 118 (2-under par), and also managed two separate aces on the day on holes #2 and #9a. The Intermediate Division displayed some great competition among the top of the leaderboard including a 108 (12-under par) from leader Vilo Sabengsy. Jordan Ramirez posted a 111 (9-under par) for the tournament earning him second place in the division followed closely by Robert Mika with a 112 (8-under par). Also of note, Brian Collett aced hole #10 for the fourth and final hole-in-one of the day. The Recreational Division was the most populated with 22 total participants. Leading the way was Justin Mackinnon shooting a 111 (9-under par). Following Mackinnon, was Nick Jensen with a 115 (5-under par) and a tie for third between Michael Malagon and Michael McGovern both earning a 116 (4-under par). In the Women’s Recreation Division Genie Livingston won her first ever tournament with a 169 (49-over par). The Novice Division was won by Joe Rasmussen with a 120 (Even Par). The 5,667 ft., 18-hole, par 55 course includes Mach 3 baskets and 4’x10’ concrete tee pads. Newly updated tee signs indicating hole location, distance, and par were added in 2016. The course utilizes both sides of Margreth Riemer Reservoir including the highest elevation in Palatine, providing scenic, well-defined fairways through rolling open terrain, winding around two small ponds with a variety of elevation changes. Recent course changes include two alternate tee locations, and four alternate basket locations. The course is unsupervised and no reservations are needed. Bring your own discs.